Thank you, Mr. President, for those kind words of introduction. Dean Marquis, members of the faculty, Board of Governors, alumni, parents, family and friends, and to the class of 2016, I am honored and delighted to be with you on this very important occasion. To each and every one of you who is receiving a diploma today, congratulations! This is your day! Enjoy it! Take a long, deep breath, and take it all in. For tomorrow you must be prepared to roll up your sleeves, because this world, this little piece of real estate, is waiting for talented men and women like you to lead it to a better place. Now I didn't grow up in a big city like this beautiful city, I didn't grow up in a big city like Los Angeles or San Francisco. I didn't grow up in a big city like Washington, D.C., or New York, or Atlanta. I grew up on a farm in rural Alabama. My father was a sharecropper, a tenant farmer. But back in 1944 when I was 4 years old—and I do remember when I was 4—my father had saved $300 and a man sold him 110 acres of land. My family still owns this land today. On this farm we raised a lot of cotton and corn, peanuts, hogs, cows, and chickens. I know here at Pardee RAND you're very smart, you're gifted. But you don't know anything about raising chickens. I know you're gifted when it comes to research, and studying the great issues of our time. But you don't know anything about raising chickens. I know some of you probably like to eat chicken. But on that farm it was my responsibility to care for the chickens. And I fell in love with raising chickens like no one else could raise chickens. When the setting hen would set, I had to take the fresh eggs, mark them with a pencil, place them under the setting hen, and wait for three long weeks for the little chicks to hatch. Some of you smart, gifted graduates are now saying, "John Lewis, why did you mark those fresh eggs with a pencil before you placed them under the setting hen?" Well, from time to time another hen would get on that same nest and there would be some more fresh eggs. Do you follow me? You don't follow me. It's OK. So when these little chicks would hatch I would fool these setting hens, I would cheat on these setting hens. I would take these little chicks and give them to another hen, or put them in a box with a lantern, raise them on their own, get some more fresh eggs and mark them with a pencil and place them under the setting hens. I kept on cheating on these setting hens and fooling these setting hens. And when I look back on it, it was not the right thing to do. It was not the moral thing to do. It was not the most loving thing to do. It was not the most nonviolent thing to do. I was never quite able to save $18.98 to order the most inexpensive incubator or hatcher from the Sears, Roebuck store. Now most of you are just too young. You don't even know anything about the Sears, Roebuck catalog. Maybe your grandparents or great grandparents, maybe some of your teachers do? Maybe not. Well, the Sears, Roebuck catalog is a very big book, a heavy book, a thick book. Some people called it a wish book: "I wish I had this, I wish I had that." I just kept on wishing. When I was about 9 or 10 years old I wanted to be a minister. So with the help of my brothers and sisters and cousins we would gather all of our chickens together in the chicken yard. My brothers and sisters and cousins would line the outside of the chicken yard … and I would start speaking or preaching. And when I would look back at them, some of these chickens would bow their heads, some of the chickens would shake their heads. They never quite said amen, but I'm convinced that some of those chickens that I preached to in the '40s and the '50s tended to listen to me much better than some of my colleagues listen to me today in Congress. As a matter of fact, some of those chickens were just a little more productive—at least they produced eggs. Growing up outside of Troy, Alabama, 50 miles from Montgomery, about 45 miles from Tuskegee, you can visit the little town of Troy. You can visit Montgomery, visit Birmingham. I saw those signs that said "White men, Colored men. White women, Colored women. White women. I'd go downtown on a Saturday afternoon to the theater. All of us little black children had to go upstairs to the balcony. All of the little white children went downstairs to the first floor. I kept saying to my mother, my father, and my grandparents, and my great grandparents, "WHY? Why this, why that?" They would say, "That's the way it is. Don't get in the way. Don't get in trouble." But the actions of Rosa Parks, the words and leadership of Dr. King inspired me to find a way to get in the way. I got in the way. I got in trouble, what I call good trouble. As you leave this great institution, Pardee RAND, you must find a way to get in the way. You must find a way to get in trouble. Good trouble. Necessary trouble. To help redeem not just the soul of America, but the soul of our little planet. You have an obligation, you have a mission. A mandate. To save our little planet for generations yet unborn and leave it a little cleaner, a little greener, and a little more peaceful. So, as the dean said, be bold. Be brave. Be courageous. Just go for it. And in doing so, be happy. Enjoy yourself. And never, ever give up, never ever give in. Be optimistic. Don't get lost in a sea of despair. Keep the faith. And never, never, ever become bitter. Never, ever hate, for hate is too heavy a burden to bear. When we were planning the march on Washington in 1963, when I was 23 years old, I was the sixth to speak. Dr. King spoke tenth—there were 10 speakers. Out of the 10 people that spoke that day, I'm the only one who's still around. And after the march was all over, President Kennedy invited us down to the White House, to the Oval Office. He stood in the door and greeted each one of us. And he kept saying, "You did a good job. You did a good job." And when he got to Dr. Martin Luther King, Jr., he said, "You did a good job. You have a dream." When historians pick up their pens and write about this period, they should be able to say to each one of you that you did a good job, that you dreamed to make our country, to make our world, and our planet a better place. So just get out there and push, and keep pushing, and you will have the victory. Not just for yourselves, but for humanity. I want to tell you, if someone had told me when I was preaching to those chickens—on occasion I tried to baptize some of them, but that just didn't work—that one day I would be standing here as a member of the House of Representatives, that I'd have had the opportunity to meet with every president since President Kennedy, to travel to South Africa and meet Nelson Mandela, to host him in Washington. To travel to Rome and meet the pope. When the pope came and spoke to a joint session of the Congress, he said to each and all of us that we all are immigrants, we all come from some other place. So as we live during this period in our history, in this country, and around the world, as the late A. Phillip Randolph, the dean of black leadership during the '60s, said over and over again, maybe our foremothers and our forefathers all came to this great land in different ships, but we're all in the same boat now. We must look out for each other and care for each other. 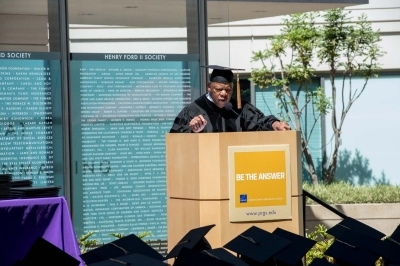 Rep. John Lewis speaking at the 2016 Pardee RAND commencement ceremony. It doesn't matter whether we are black or white, Latino, Asian American or Native American. It doesn't matter whether we are straight or gay. We are one people, we are one family, we are one house. We all live in the same house, the world house. And when we see people putting people down because of their race, their color, their faith, or because of who they love, you have a moral obligation to speak up, to speak out, and get in the way. When you see violence in our midst similar to the violence that happened a week ago in Orlando, you have to do something, you have to say something, you have to be prepared to condemn it. Maybe with your research, your studies, you can find a way to try to get humankind to be a little more human. What's wrong with saying to someone, "I love you"? In the Congress, I say to many of my colleagues and friends, I'll say, “How are you doing today, brother? How are you feeling today, sister?" There's a member, I call him by his first name, it's Paul, and I say to him when I see him each day, "Hello, Brother Paul," and he'll say to me, "Hello, Brother John." There's another member. Her first name is Louise. We came to Congress together. I'll say, "Hello, Sister Louise, how are you doing?" She'll say, "How are you doing, Brother John?" Just love everybody. Love is a better way. Never ever get so mighty, so powerful, so smart that you ever forget to love. Love your friends, your family. Love your associates, and help create what Dr. King called the "Beloved Community," the beloved world. We can do it. We must do it. I wish you well. I want to tell a little story, then I will be finished, for today is your day. When I was growing up outside of Troy, Alabama, 50 miles from Montgomery, on that farm, I had an aunt by the name of Seneva. And my Aunt Seneva lived in a shotgun house. Now here in Santa Monica, here in this beautiful state, here you don't know what I'm talking about. You've never seen a shotgun house. What is that? Well, my Aunt Seneva lived in a shotgun house. She didn't have a green, manicured lawn. She had a simple, plain dirt yard. And sometimes at night you could look up through the holes in the ceiling, the holes in the tin roof and count the stars. If it rained, she would get a pail, a bucket, a tub, and catch the rainwater. From time to time she would walk out into the woods and cut branches from a dogwood tree and tie these branches together and make a broom and she would call that broom the brush broom. And she would sweep this dirt yard very clean, especially on a Friday or Saturday because she wanted the dirt yard to look very good during the weekend. For you, very young and smart and talented graduates, you don't know what a shotgun house is. In a nonviolent sense, it’s an old house [with] one way in, where you can bounce a basketball through the front door and it would go straight out the back door. Well, one Saturday afternoon my Aunt Seneva saw us all playing in her front yard, when an unbelievable storm came up. The wind started blowing, the thunder started rolling, the lightning started flashing, and the rain started beating on the tin roof of this old shotgun house. She called us all in and told us to hold hands. The wind continued to blow, the thunder continued to roll, the lightning continued to flash, and the rain continued to beat on the tin roof of this old shotgun house. My Aunt Seneva thought this old house was going to blow away. She became terrified, she started crying. She thought the house would blow away, so she got all of us to hold hands. Then one corner of this old house appeared to be lifting from its foundation, so she had us go up to that corner to try to hold the house down with our little bodies. When the other corner appeared to be lifting, she had us walk to that side. We were little children, walking with the wind, but we never left the house. I say to you, the wind may blow, the thunder may roll, and the lightning may flash, and the rain may beat down on our old house, but you have an obligation, you have a mission, you have a mandate to stay with the house and hold on to your principles. Hold on to your beliefs. Call it a house of Pardee RAND. Call it a house of California. Call it a house of New York or Georgia. Call it an American house. Call it a world house. We all live in the same house. Let's stay together. And never give up. Never give in. Keep the faith. And walk with the spirit of this institution, and you'll be all right. Thank you very much.